The next opposition leader of Scotland’s regional parliament just might be an openly gay Conservative woman. It sounds farfetched, but polls show that as the Scottish National Party (SNP) continues to lead by a wide margin with regional elections approaching on May 5, the Scottish Labour Party has sunk so low that Scottish Conservatives actually have a strong chance to place second — albeit a very far second behind the SNP and its popular leader, Scottish first minister Nicola Sturgeon. 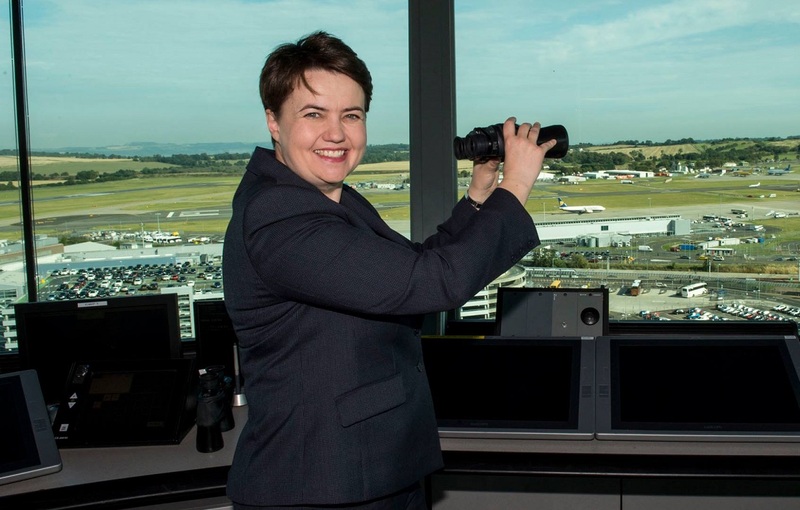 If the Tories do indeed pull off a victory in Scotland, it would be a once-in-a-generation opportunity for Scottish Tories to rebrand themselves in Davidson’s image — and it would make Davidson, nearly overnight, a model figure in the modern Conservative Party. The latest Survation/Daily Record poll conducted between April 15 and 20 gives the SNP a massive lead with 53% of the vote. Far behind in second place was Labour with 18%, but directly behind Labour? The Conservatives with 17%. It’s virtually a law of post-Thatcher British politics that Scotland is a no-go zone for the Tories. In the 2015 general election, prime minister David Cameron’s Conservatives won just one seat (out of 59) and 14.9% of the vote, its lowest-ever vote share. The last time the Conservatives won even 25% of the Scottish vote in a general election was 1992. Since the 1997 landslide that wiped out the Conservatives, the party has elected just two MPs and, since 2005, the only Tory MP has been David Mundell, who represents Dumfriesshire, Clydesdale and Tweeddale. Since May 2015, Mundell has served as the secretary of state for Scotland. It’s been even worse for the Scottish Tories in local elections — the region-wide Conservative vote was just 12.4% in 2011 and just 13.9% in 2007. In Scotland’s post-devolution history (it’s had a regional parliament only since 1999), the Conservatives have held no more than 18 seats (out of 129). So it’s remarkable that, at this point, the Conservatives even have a shot at becoming the official opposition at Holyrood. 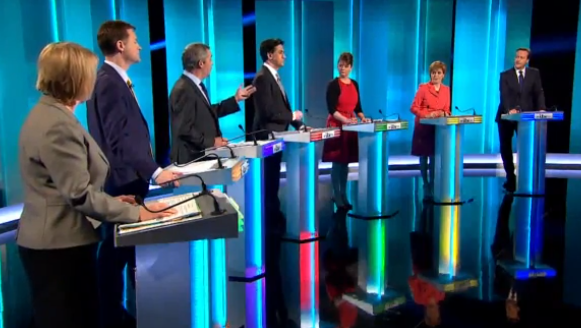 9:57: Obviously, it’s hard to ‘keep score’ of ‘winners’ and ‘losers’ in a seven-way debate. Bennett seemed largely invisible and, aside from the dust-up over immigration, so was Farage, who tried to turn every other question into an opportunity to discuss the European Union and immigration. Wood and Sturgeon had strong nights, and their attacks on Cameron often made the Labour case better than Miliband’s arguments. Sturgeon, in particular, will have benefited from airing Scottish grievances directly to a British prime minister for the first time in a leader’s debate. Clegg tried, sometimes successfully, to position himself as a sensible moderate. He also successfully signaled that he could work with a Labour government as well as a Tory one. Miliband was most successful, I thought, in his criticisms of Cameron’s EU policy and his plans for the NHS. But he didn’t have any clear moments where anyone could say, ‘Aha, there’s the next prime minister of the United Kingdom of Great Britain and Northern Ireland.’ He came across as a thoughtful, earnest opposition leader.